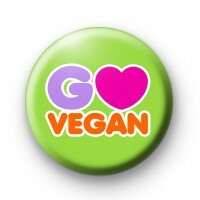 Go Vegan 25mm Button Badge. This Vegan badge is bright green with a big bold purple G, a bright pink love heart and the words Vegan written in orange. If you're plant-based and proud to be a member of the ever-growing Vegan community then this badge is perfect for you to wear. We think it's a great badge for any proud Vegan, or if you're taking part in Veganuary this year and trying to make healthier more environmentally friendly food choices. Our Vegan badges are a great way to start conversations about Veganism. We have loads of Vegan and Vegetarian designs so be sure to have a look on the website or a quick search.